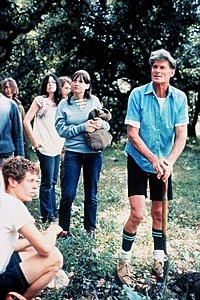 English master gardener Alan Chadwick with UCSC students in 1967. Decades before Wal-Mart began selling organic food, a charismatic Englishman and a group of students transformed a brush-covered hillside at the University of California, Santa Cruz, into a lush garden where vegetables and flowers were grown without chemical pesticides or fertilizers. Since that groundbreaking day in 1967, UCSC has become the "Harvard of organic farming," helping to transform the way food is grown, influence consumer trends and eating habits, and make "sustainability" a household word. "We are small but mighty -- an incubator for innovation," said Sheldon Kamieniecki, dean of the Division of Social Sciences at UCSC. "Our influence proves you don't have to be a big ag school to have major impacts on farming and food distribution." UCSC researchers pushed the envelope when they teamed up with farmers and pioneered the organic production of several key crops considered impossible to grow without synthetic inputs: strawberries, apples, artichokes, and cotton. "When skeptics said 'You can't grow strawberries without fungicide,' our researchers teamed up with Jim Cochran of Swanton Berry Farm and said, 'Let's figure this out,'" said Patricia Allen, acting director of UCSC's Center for Agroecology & Sustainable Food Systems (CASFS). "Now, organic strawberries are widely available in grocery stores." Those breakthroughs in the field set the stage for cutting-edge work on sustainability: CASFS researchers have pushed the agenda of sustainability beyond ecological stewardship to address social justice issues of food production, such as the rights of workers to fair wages, decent working conditions, and access to healthy food. On a parallel track, natural scientists are conducting pioneering research to help farmers optimize the use of nutrients in organic production. "Today, Jim Cochran is at the forefront of the social justice side of sustainability by using union labor on his farms," noted Allen. UCSC scholars and researchers are influential voices in the hottest debates of the day, from food safety and genetically modified crops to fair-trade principles and tension over "local versus organic" production. "We are continuing to shape the agenda," said Allen. Considered by many the birthplace of organic agriculture, UC Santa Cruz will celebrate 40 years of leadership in sustainable food production and education when it hosts a public symposium July 28 (see the schedule of events).
. The Center for Agroecology & Sustainable Food Systems (CASFS) within the Division of Social Sciences generates trend-setting research and scholarship, including Allen's influential books, Together at the Table: Sustainability and Sustenance in the American Agrifood System and Food for the Future. Researchers have contributed numerous crop-production training manuals for Cooperative Extension agents in California, while faculty affiliates from the Environmental Studies Department and elsewhere on campus are conducting natural-science research that focuses on water-quality, nutrient-management, and insect-ecology issues within farming systems.
. The Apprenticeship in Ecological Horticulture has helped revitalize small-scale farming by providing hands-on training in organic production to more than 1,200 people, including students from Africa, Asia, and across the United States. (See profiles of graduates.) In addition, UCSC offers the only formal training in community-supported agriculture programs (CSAs). In January, the apprenticeship received a coveted Steward of Sustainable Agriculture Award from the Ecological Farming Association.
. The UCSC Farm is a 25-acre working organic farm run primarily by apprentice labor that also hosts organic field research trials, undergraduate education, community outreach events, the "Farm to Cafeteria" program, and the Life Lab Science Program, which has developed a garden-based science curriculum and worked with more than 1,400 schools across the United States.
. The UCSC Food Systems Working Group is a leader of the national farm-to-institution movement that is lobbying schools, colleges, hospitals, and other institutions to buy fresh food from local farmers. UCSC Dining Services is at the forefront of environmentally friendly practices within the UC system and beyond, serving a high percentage of local and organic produce in campus dining halls, recycling used cooking oil, and switching from a national to a local food distribution company to support the local economy and reduce fossil-fuel consumption.
. UCSC's influence on higher education is far-reaching. UC Davis, for example, has incorporated sustainability into its College of Agricultural and Environmental Sciences, while UCSC's training manuals and advice have helped establish campus-based farm education programs across the country, including at Washington State University, Colorado State University, the University of Georgia, the University of Montana, and Michigan State University. Last year, the campus helped found the National Sustainable Agriculture Education Group to boost the number and quality of such college and university programs. "Today, the hillside where it all began beckons visitors to the Alan Chadwick Garden, and the spirit of innovation that first took root there has infused all that has come since," said Allen. Editor's Note: Patricia Allen can be reached at rats@ucsc.edu. This release and other materials, including the symposium schedule, a timeline, and profiles of former apprentices, are available on the web.